Hua Lin sincerely wanted to take in the youth called Bai Zhiyuan as his disciple. As a good owner that loved his spiritual beasts and a Demigod practitioner who had focused on the spiritual beast taming business for several hundred years, Hua Lin could not resist a good youth who had a tenacious body akin to a spiritual beast. He was itching to take him in, and wanted to nurture him properly, train him meticulously… Eh, things are starting to sound weird? As for spirit veins, the hell were they? It had been many years since he encountered a good seedling that could stir his heart in such a manner. No matter what, he had to take him in under his tutelage. In order for that to happen, he would not hesitate to do anything, even if it’s taking in his master, or his master’s master under his tutelage as well. In any case, being a master, grandmaster, or great grandmaster was of no concern. He felt that he could still accept those titles. “Daoist Yu, just who is your master? Why don’t you call your master out? Don’t worry, I’m a really good master.” In the world of wandering practitioners, he had a very big say in things. The corner of Zhu Yao’s lips twitched. If I call him out, you’re dead meat! Even little tyrant silently turned his head away as well. “Ahem, Sovereign Hua Lin, come over here for a bit.” Zhu Yao sighed, as she waved her hands at him with a darkened face, motioning him to come over. “Mn?” Hua Lin was startled. Could it be that she was troubled with something? Thus, he curiously leaned over. “I say, Hua Lin…” Zhu Yao brought him towards a corner of the stage, and patted on his shoulders. In an instant, she released her Demigod pressure, while restricting it to the area they were standing in. Hua Lin’s legs trembled, and he was this close to kneeling down. “…” His expression turned deathly pale. When did a late-stage Demigod appear among wandering practitioners? No one had informed him about it! He shook his head wildly! When Zhu Yao brought him back to the center of the stage, Hua Lin’s legs were still trembling a little. The girls now sure are brutal. As I thought, am I already outdated? “Haah…” He looked at Bai Zhiyuan with a resentful look. If you already have a Demigod practitioner as your master, say so earlier! You made me lose face. “Daoist Bai, an encounter is still a form of fate. Though we do not have the fate of being of master and disciple, why don’t we… become friends?” Is it too late to mend our relationship? Little tyrant was startled for a moment. He turned to look at Zhu Yao, and when he saw her nodding her head, he nodded as well. Hua Lin instantly revealed a flowery smile. Since they were friends, then let the matter of stealing away a disciple earlier be bygones. Little tyrant was startled, and then, he turned to look at Zhu Yao. The hell, why did she forget about this matter? Isn’t it just giving a name? Giving a name or whatever, is something she’s best at. 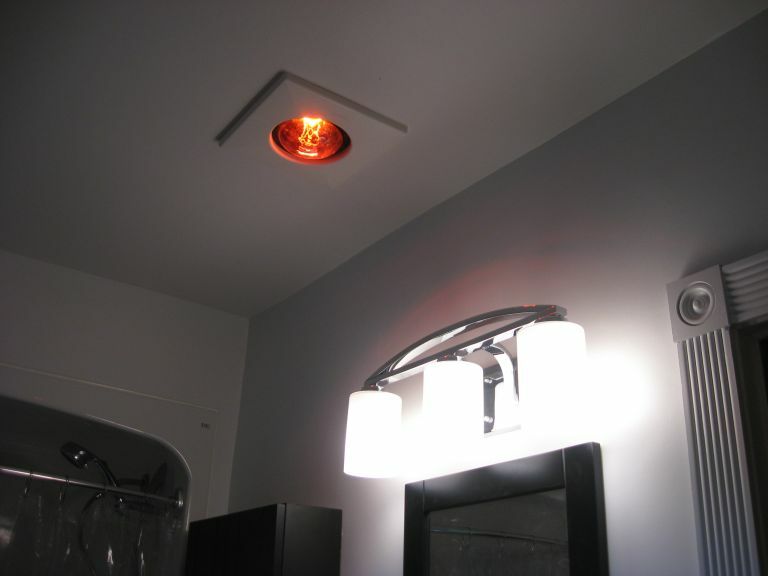 Bathroom Heat Lamp (Yu Ba) Bai Zhi Yuan: “…” Why did he feel something was odd? Hua Lin chatted with the two of them for half a day. Only then did Zhu Yao realize that this Demigod Sovereign, was a chattering box. If she had not interrupted him, she believed that he could have continued on for the entire day, all the way to the next morning. When Zhu Yao finally clearly expressed her intentions to leave, he unwillingly let them off. Presently, the people around the arena had long gone off. “Remember to come back often to play!” Hua Lin waved his hands at the two of them. Just as Zhu Yao was about to fly off on her sword, from the corners of her eyes, she glanced at the Scaled Dragon which had been crying all day long on the tall stage. Sighing, she could not help but walk over. The Scaled Dragon was startled for a moment, and then he raised his head from the spiraling coil. Its large, reddened eyes glanced in her direction, and in an instant, they sparkled. It then let out a frail sound. The Scaled Dragon’s sadness finally began to dissipate, as it weakly stretch out the tip of its tail. It no longer kept its body in a coiled state, recovering its demeanour as a tyrannical Scaled Dragon, and it began to playfully twist and turn. As expected of Daoist Yu! She really had skills in the arts of beast taming! Even this Scaled Dragon of his was no longer throwing a tantrum. As expected of a late-stage Demigod Sovereign. Seeing Zhu Yao who had already flown off on her sword, admiration instantly filled Hua Lin’s heart. Eh, wait a minute. What was that black figure following behind her? The hell, it was his Scaled Dragon. Come back! You’re my spiritual beast, hey! Zhu Yao had initially decided to return to Peaceful Spiritual Forest, but the spiritual energy within little tyrant’s body suddenly began to stir abnormally, and there were traces of him making a breakthrough. She had no choice but to change her plan in an instant and rented a cave residence to settle down in. A week later, little tyrant successfully broken into the intermediate-stage Foundation level. It seemed like this tournament had greatly influenced the growth of his mental state. Just this single trip alone had risen his cultivation. In the future, she had to consider putting study trips and the like into her education plan. “What’s the rush?” She was planning on going on a study trip now! The corner of little tyrant’s lips twitched, as he shook the storage pouch in front of her eyes. He silently lowered his head, and looked at her hands. She was holding onto a basket filled with Scentless Fruits. “… Hohoho. Aiya, don’t mind such small details.” It was just that her mouth was itching a little, so she bought a little more than expected. “…” Why did she feel like she was being seen as a prodigal? “Why don’t… I refine some mystic artifacts and sell them?” She was rather confident in her crafting skills. “Alright, let’s go home!” Let’s go and oppress that rich tycoon frog! Just as they stepped out of the cave residence they rented, they bumped into a joyful Hua Lin who came to look for them. His dimples showed when he smiled, as he enthusiastically waved his hands at the two of them from afar. “Little sister?” Who’s your little sister? Little Eighth spat out a mouthful of flames. She’s my elder sister! Cold air enveloped the surroundings. A certain master: A friend like this will steer my disciple astray. “…” Then what should I address her as? “We ran out of money, so we’re returning home.” Zhu Yao replied. “…” You’re just here to flaunt your wealth, aren’t you? Seeing that the two of them were not looking too good, he realized the ambiguity in his words. He immediately attempted to save himself. “What I’m meaning to say is, every single small or large establishment belongs to my Wandering City. If fellow daoists wish to stay, putting aside the cost of renting them, it isn’t even a problem to gift a cave residence to fellow daoists.” As he said that, he waved his hand. The formation core at the entrance used to place spirit stones with instantly flashed green. Seeing that Zhu Yao did not look as if she was kidding, Hua Lin pulled out a pouch for storing spirit stones with a darkened expression. From it, he took out a high-grade spirit stone. Zhu Yao casually swiped away… the pouch he was holding. Zhu Yao immediately passed the pouch full of spirit stones to little tyrant, her household finance manager, and winked. Hurry and keep it. If it’s still not enough, we can ask this old man for more. In any case, he’s stupid and has lots of money. Zhu Yao nodded. “Of course! But what does that have to do with wandering practitioners?” The Great Inter-Sect Tournament naturally involved the participation from various sects and clans, but it did not have any relations with wandering practitioners which did not belong to any faction, right? “Mn?” What did he mean? Zhu Yao frowned. Wandering practitioners were indeed experiencing the worst lives out of all practitioners. Many of them were people who were disqualified by the various sects due to their terrible spirit veins. However, because they did not want to reduce themselves to mere heretic practitioners, they continued to live on without feeling embarrassed. Naturally, they would be oppressed everywhere they went. “Then, what plans do you have?” Could it be that he wanted to seek revenge against the various sects and clans? OMG Sis Yao… At least gave him daoist name Yu Bai (white Jade) ??? She’s always merciless, first Soi Sauz, then Yu Luo (Bo), now Yu Ba ??? Yue Ying slipped narrowly, his fortune get named by that sect head ??? He wishes he were Yu Bai, at least if he ever learns the meaning, she named him Yu Ba (like the note says, Heat Lamp), but let’s not forget, it’s not all her fault, she was named Yu Wang, which if I remember was Jade Prosper, taken as Desire by her. Sis Yao always had mercilessly bad naming skill ? A certain Little sister: “Little sister?” Who’s your little sister? Little 8th who spat out a mouthful of flames: She’s my elder sister! Cold air enveloped the surroundings. A certain master: A friend like this will steer my disciple astray. *sigh* Hua Lin ah, why do I have the feeling that you’re acting like Zi Mo from Ancient Hill sect? Is dat you? They don’t even have a Jade Forest Mountain right now, and the Jade Forest common customs are still being followed, shamelessly bully the sect master, and make off with anything that seems of use if it is, even vaguely, offered. Sis Yao has no mercy in her delinquent ways! ? I think Yu Yan is the one who is teaching his disciple “good” things. Look how she just took something from Hua Lin like how he used to take from Zi Mo. I wonder if Yu Luo and little tyrant will ever meet and reminisce about being Zhu Yao’s disciple. and well i didnt see this one coming….the autor sure is good at what it does.